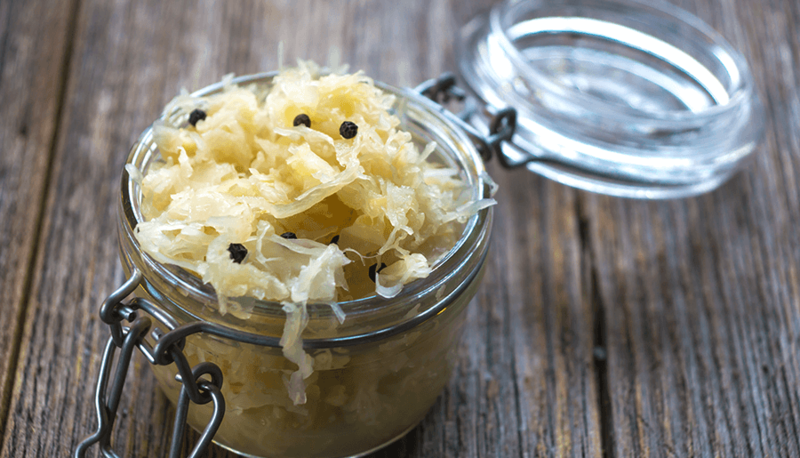 Home-made sauerkraut is incredibly easy, very tasty, and has many health benefits as it is a ‘live’ food full of beneficial bacteria. It is also great fun to make! Occasional batches of kraut go mouldy and have to be discarded, but this risk is reduced to (almost) zero if you choose the right kind of cabbage – see note below. You’ll also need a large glass or ceramic jar, and another smaller jar that will fit inside the neck of the large one (or something of a similar size- you can also use a ziplock bag filled with water) to use as a weight. Chop the cabbage and radishes finely and as you do so, put them into the jar with a sprinkle of the salt. The aim is to have the cabbage, radish and salt evenly mixed as you pack the jar. If you’re using the dill, add a pinch every now and then as you go along. Press the cabbage down firmly into the jar as you go (use your hand, a rolling pin or wooden spoon) You can be quite forceful, it helps to ‘bruise’ the cabbage a little. Stop once you get to about an inch from the top of the jar. If you have any salt left over, add it now, and press the mixture down firmly into the jar. Now, add a clean weight to keep the cabbage pressed down. 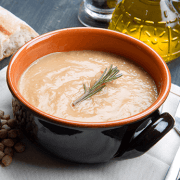 This is what the small jar is for – fill it with water and place on top of the cabbage mixture. Over the next day the salt will begin to draw the juice out of the cabbage and radishes and you’ll see the liquid level in the jar rising. After 24 hours the vegetable juice (now a brine) should completely cover all the vegetables. If any cabbage or radish is poking above the surface, press it down. If you need to, add a little water. Now, just wait. Cover the jar with a clean cloth or tea-towel to keep out dust and flies, leave it out on the kitchen surface, and inspect it regularly. It is vital that the cabbage stays below the water line, otherwise it may begin to rot, and could spoil the whole batch. After another day or so (depending on temperature) you’ll see bubbles forming and rising up to the surface – this means fermentation has begun. It’s fun to taste the kraut every day, to keep track or its changes. As it ferments it will become gradually more sour, and the cabbage will get softer. You can stop the process whenever you’re happy with the finished product. About a week or two is normally right – but you could leave it longer. Fermentation will be slower if it’s cold, and in the Winter I sometimes leave mine for a month. At this point, transfer the kraut (and liquid) into smaller jars with lids and put them in the fridge. This will preserve the beneficial bacteria that are there, but stop any further fermentation. Use your kraut as you would any pickle. It’s good with salads or in sandwiches. A note on cabbage: For some reason, certain kinds of cabbage seem to easily go mouldy instead of fermenting. Sweetheart (hispi) cabbage seems to be particularly bad for this. I’ve only every had 2 batches of kraut go mouldy, and both times where when I was experimenting with different kinds of cabbage. To start with, make sure you use a ‘bog standard’ round white cabbage. Once you’ve got the basic recipe under your belt, you can try adding different herbs or spices, or mixing the cabbage with other veg. 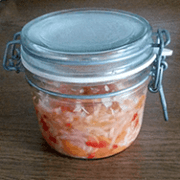 If you like spicy foods, give my kimchi-kraut a try. Hey Neil. I’ve tried to make this twice but they went mouldy. Would it be to do with microbes in the air or not a good enough jar sterilising technique? Hi Chrissie. Hard to say exactly – could be not enough salt (but unlikely) – are you making sure the veg is fully submerged? If you’re sterilising the jar first that could be your problem – you *want* the bacteria, they will preserve the kraut! I just use clean, but unsterilised equipment. The salt is there to stop unwanted bacteria, so there’s no need to worry about sterilisation.